Imagine winning one thousand dollars in FREE Ravens merchandise! You would be the envy of all your friends; you would tailgate in style; and you would finally achieve "superfan" status. There is finally a way you can be THAT GUY (or girl). 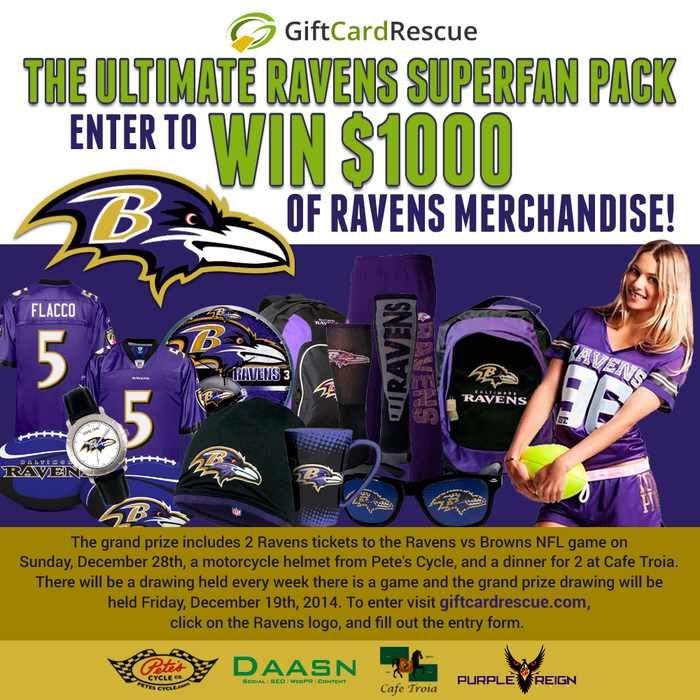 GiftCardRescue is giving you a chance to win the Ultimate Ravens Fanpack. Plus, a TON of Ravens merchandise for you to tailgate in style. Weekly Prize: Every game day, one lucky winner will be chosen to win their favorite Ravens gear! What is Gift Card Rescue? Gift Card Rescue is located in Columbia, MD and loves to get involved with the local community. By hosting this Ravens Sweepstakes, they are able to support the local sports team and reward their customers a chance to win this huge prize. GiftCardRescue.com is the industry leader in buying and selling unwanted gift cards and merchandise credits. If you find yourself with a wallet full of gift cards that you have no use for, selling them to GiftCardRescue.com will get you extra cash. You can also use Gift Card Rescue to buy discounted gift cards to all your favorite stores for up to 35% off! Popular merchants you will find on their site include Target, Lowes, Walmart, Darden Restaurants, and over 400 more. 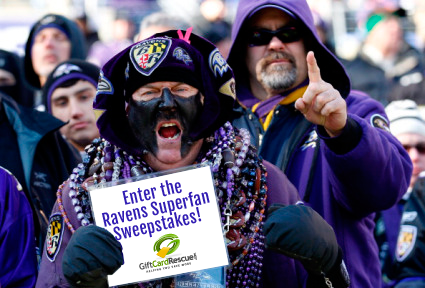 Sponsors of the Ravens Superfan Sweepstakes include: Daasn, Pete's Cycle, Cafe Troia, and Purple Reign.